It was handed down that Emperor Qianlong in Qing Dynasty once got drunken, after a cup of tea he regained refreshness and asked in surprise "Where is the tea from? ", and got a reply that it was Yunnan that produced it. From then on, it become a tribute and got fame all over China. These are 4 square bricks of Pu-erh tea pressed with the Chinese characters of good fortune, salary, long life and happiness. 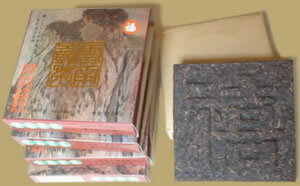 The tea packed in paper boxes, (15.5cm X 15.5cm X 3cm), weighs about 500 grams each. 4 bricks stack.